Israeli Prime Minister Ariel Sharon and Palestinian leader Mahmud Abbas announced the end of four years of violence at a landmark summit in Egypt today, setting the stage for a full-scale revival of the peace process. As it accuses Iran of trying to develop nuclear weapons, the USA is preparing to upgrade and renew parts of its own ageing nuclear arsenal. Critics believe the upgrades could lead the USA to breach the treaty banning the testing of nuclear weapons. 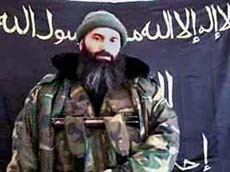 The US$ 419 billion-defence budget proposed by President George W. Bush for the fiscal 2006 emphasises that America's aim in the global war on terror is to eliminate sanctuaries for terrorism and capture Al -Qaida leaders. The World Bank President, Mr James D. Wolfensohn, assured Islamabad on Monday that a neutral expert would be appointed soon to resolve Pakistan-India differences over the Baglihar dam following completion of the necessary steps. Nepali troops backed by helicopters have attacked Maoist camps in the jungles in the west of the country, as part of a new offensive against the rebels launched after the King seized power a week ago. Israeli Prime Minister Ariel Sharon and Palestinian leader Mahmud Abbas announced the end of four years of violence at a landmark summit in Egypt today, setting the stage for a full-scale revival of the peace process. “We have agreed with the Prime Minister to cease all acts of violence against Israelis and against Palestinians wherever they are,” Abbas said at the summit in the Red Sea resort of Sharm el-Sheikh. “We have an opportunity to turn our back on the bloody path imposed on us over the last four years,” added Sharon, expressing hope that the summit would mark the day when the peace process was relaunched. The summit, the first between Israeli and Palestinian leaders for over four years, comes amid a growing rapprochement after the moderate Abbas’s election a month ago and a new commitment by the United States to seek Middle East peace. The pair met for the first encounter between Israeli and Palestinian leaders for over four years after Sharon held his first ever meeting with the summit host, Egyptian President Hosni Mubarak. “The calm that is currently prevailing in our territories signals the start of a new era, the start of a hopeful peace,” Abbas added. “What we have announced today is the implementation of the first phase of the roadmap ... and an essential step to give us a chance to put the peace process back on track.” Sharon warned, however, that it was a “fragile opportunity” for peace, saying there were “extremists” waiting to derail the process. A number of truces had been agreed between Israel and the Palestinians since the intifada erupted but all collapsed within weeks. Along with Mubarak and King Abdullah II of Jordan, who was also attending, the leaders faced each other over a large round table, giving their declarations in turn and flanked by their respective delegations. Abdullah did not speak. 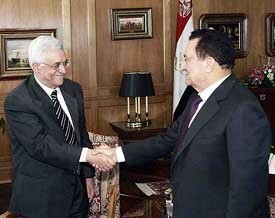 Mubarak hailed what he said was a “positive spirit” between Israel and the Palestinians and said he hoped it would lead to an “honest and serious” implementation of the roadmap peace plan. Sharon also confirmed that Israel would release hundreds of Palestinian prisoners. The summit comes just a day after new US Secretary of State Condoleezza Rice wrapped up a visit to the region declaring that both Sharon and Abbas had both accepted invitations to meet US President George W. Bush at the White House. Since the project will likely involve replacing technology developed in the 1960s with the latest available, watchdogs are concerned the USA might be inclined to test such weapons and breach the 1996 Comprehensive Test Ban Treaty (CTBT). ‘‘It is being done to revitalise the existing stockpile,’’ said Matt Martin, Deputy Director of the British and American Security Information Council (BASIC). Of more concern to watchdogs is the Bush Administration's dedication to developing a new breed of bunker buster nuclear weapons, designed to penetrate the most toughened underground defences. Critics say the plan reveals the administration's hypocrisy and undermines international efforts to persuade other countries not to develop weapons. Last week it was revealed that Defence Secretary Donald Rumsfeld had sent the Department of Energy a memo requesting that it set aside funds to resume a study to examine the development of a bunker buster. The study was halted last year after Congress removed its funding. The Department of Defence is fighting the global war on terror by working with allies to isolate and eliminate terrorist cells and support emerging democracies, the budget plan presented to the Congress yesterday said. It makes it clear that in 2005, the USA expects to maintain "substantial force levels" in Iraq to ensure security and help. Washington also expects to maintain a significant force in Afghanistan. The fiscal 2006 Budget and the 2005 supplemental, fund a wide variety of unmanned vehicles; the continued development of a reconfigurable warship that can be effective in multiple missions; the realignment of Army units to make them more flexible and more easily deployable. The assurance to this effect was made by the Bank chief to President Gen Pervez Musharraf and Prime Minister Shaukat Aziz here at a meeting. An official source said President Musharraf raised the Baglihar Dam question with the visiting Bank chief and told him that it was a crucial issue for Pakistan. Mr Wolfensohn said the World Bank was required under the Indus Waters Treaty 1960 to complete certain steps before the appointment of a neutral expert and the bank would follow procedural requirements. He also assured the Pakistan President that there would be no delay in this respect, the source said. President Musharraf conferred the award of Hilal-i-Pakistan on Mr Wolfensohn in recognition of his all-round attainments, outstanding leadership and the Bank's invaluable support to Pakistan's economic growth, poverty alleviation and good governance. An official statement said the World Bank chief discussed the bank's continued cooperation and support for Pakistan's sustained economic growth. 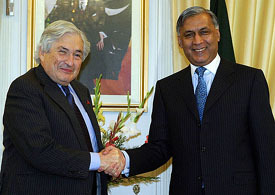 Mr Wolfensohn appreciated the economic strides Pakistan had made in recent years in the wake of reforms and economic and fiscal stability, it said. Meanwhile, the Adviser to the Prime Minister on Finance, Dr Salman Shah, assured the Bank chief that Pakistan still faced corruption-related problems at the middle level although higher level corruption had been eliminated. 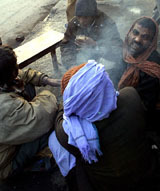 The official statement said replying to a question about corruption in Pakistan, the Adviser pointed out that corruption had been eliminated at the higher level but there were middle level problems which the government was trying to overcome by way of institutional strengthening and curtailment of discretionary powers of police and tax officials. The Adviser apprised Mr Wolfensohn of the performance of the economy in the light of various reforms introduced by the government in fiscal, financial, administrative, institutional, agricultural, banking and governance areas. The poverty reduction strategy of the government was also discussed. It was observed that the reforms had started delivering the desired dividends and the macro-economics indicators were gradually moving upwards. The Adviser asked the World Bank to support Pakistan in the development of infrastructure needs of the fast growing economy, including the energy sector. Dozens of Maoists have been killed in the strikes in training camps and shelters near the western city of Nepalgunj, newspapers reported today, but the army said it was still waiting for details. A senior military officer in Nepalgunj said on the telephone the troops were returning to the city after Monday's operation, but he did not yet have the casualty figures. The army said at least three Maoists had been killed in other clashes and a soldier had been killed defusing a land mine the same day. The rebels have not commented on the latest clashes. King Gyanendra sacked the governmentand suspended civil rights and seized power in what some analysts said was a move to give free rein to the army against the rebels to end a nine-year-old rebellion to topple the monarchy and set up a communist state.